What a beautiful watch! And the whole package, box and all. I don't think I've seen a better example, and the box is mint also. I'd agree with 1953 American Girl 'Y'. Wonderful example, it's nice to see them in this condition. Advert is a bit hard to see details but it sure looks like a match to me. Advert looks to be the closets match. 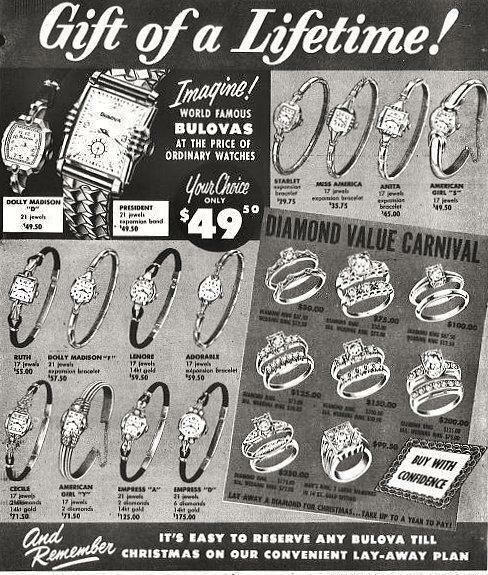 There are a number of 2 diamond variants, but the Bulova American Girl 'Y' variant looksd the closest.